‘HQ’ can stand for ‘headquarters’ and 'high-quality' and when it comes to C-TEC’s new 20,000 sq. ft Challenge Way extension both terms are appropriate! The six-month project to expand our head office and manufacturing facility is complete. Mirroring the magnificent design of our existing 75,000 sq. 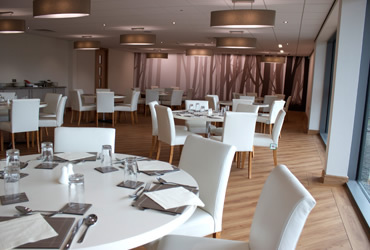 ft. building, the state-of-the art two-storey construction houses conference facilities, training rooms, offices, a restaurant, private dining room and staff canteen. 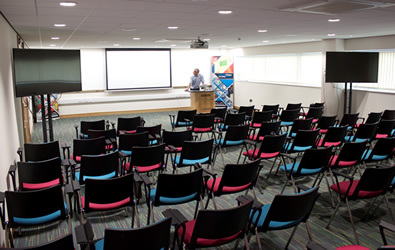 As well as being used by C-TEC for its own industry training events, the new conferencing facilities, which include an 80-seat seminar suite, are available for hire with special rates available for those in the fire and security industry. All rooms are fully equipped with top-of-the-range AV facilities and, of course, audio-frequency hearing loop systems for the hard of hearing. Powerful video conferencing software is also installed. Should you wish to request a factory tour during your event, these can also be arranged, subject to availability.